Mother nature wastes nothing. As trees age and fall in the wilderness, the organic material and nutrients in the dead tree return to the soil to enrich and replenish it. It is productive throughout its life, and then it is valuable still after it has died. In the past, people have not given much thought to using every bit of a tree that has come to the end of its life. There was seemingly an endless supply of trees that would not be depleted, or so we thought. 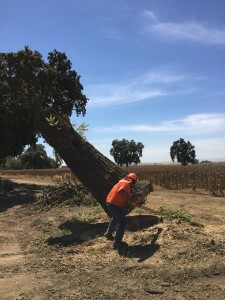 Our understanding of this resource has changed, and we now know that its necessary to make wise use of the trees we have, and to use every bit of the trees that come down in storms, or because of disease, or when they pose a hazard. Good lumber is getting harder to find, and it is important for us to start thinking about other sources for our wood. It just doesn’t make sense for us to waste any of the precious wood from trees in the urban landscape. We all need to do our part to preserve this natural resource while we still have it. It’s vital that we be responsible with the way we harvest and utilize the trees we have. Using the entire tree is not just good in theory, it’s something we have to take very seriously. Visit our page about hardwood salvaging here.